How Does the Rest of the Grocery Industry Respond? If you follow the grocery industry, by now you have surely heard of the blockbuster Amazon and Whole Foods deal. According to the Harvard Business Review, Amazon spent $13.7 billion to acquire over 450 brick-and-mortar Whole Foods stores, sending shock waves through the grocery industry. However, beyond acquiring physical locations — many of which are urban and thus highly desirable for a company looking to expand — Amazon has also increased its delivery capability by acquiring highly strategic distribution nodes. Furthermore, Amazon has acquired a foothold in one of the few retail industries that remained elusive. Understandably, now that Whole Foods and Amazon are one, many people are concerned about the future of grocery retailing. The old narrative about Amazon was that they were going to render brick-and-mortar stores obsolete. As Amazon found new ways to bring product categories into the digital space, many have anticipated that Amazon would leave a trail of traditional retailers out of business. However, more recently, the tenacity of certain types of brick-and-mortar stores has motivated Amazon to bring their business full circle. In certain urban centers, Amazon has already begun opening up physical book stores, re-entering a market that was their first target of industry disruption. Yet, buying real estate, especially in urban centers, and doing new construction has proven challenging for Amazon. With the purchase of Whole Foods, Amazon can circumvent this step. They now have control of over 450 physical locations, many placed in the most desirable urban locations, giving them a way to interface with the core market: young urban consumers. In addition, these stores can double as strategic distribution nodes. Distribution logistics in urban areas is notoriously difficult, as package delivery and multi-story apartment units present certain unique challenges. However, Amazon has been experimenting with faster delivery to customers who are also willing to pick up their package at a nearby delivery center. To put it more concretely, consumers will now be able to pick up an Amazon package at the Whole Foods market they already planned to visit. Because of Amazon’s expansive and sophisticated supply chain, they will be able to guarantee delivery to these nodes at rapid turnaround times. Instacart is a grocery direct-delivery service that is perhaps the most directly threatened by the Amazon and Whole Foods acquisition. Instacart has operated closely with Whole Foods — along with other grocery retail brands such as Cosco, Target and Petco — to provide the very same service Amazon is expected to provide now. In fact, because Whole Foods markets itself to the types of consumers that Instacart is trying to reach — the digitally connected and savvy urbanite — Whole Foods was perhaps the cornerstone of Instacart’s delivery model. Losing Whole Foods could be devastating for Instacart. To keep up, Instacart just inked a deal with European grocer Aldi, but at this point, it is a race for grocery e-commerce dominance. And unfortunately for Instacart, when it comes to online shopping, shipping and delivery logistics, Amazon has a lengthy head start. While Instacart’s prospects are looking grim, AmazonFresh — Amazon’s own grocery e-commerce initiative — is getting a boost. AmazonFresh has lagged behind other sectors of Amazon’s business. While the convenience of buying books, media and tech gadgets online has allowed Amazon to expand at an incredible rate while severely cutting into the profit margins of booksellers and big box stores, many of even the most devout Amazon customers have still preferred to buy fresh foods at their local grocery store. Furthermore, those who are willing to buy groceries in the digital space have opted for other, more focused grocery e-commerce retailers like Blue Apron. Many suspect this consumer behavior was the result of Amazon’s association with efficient budget retailing. Consumers who like such savings and convenience when it came to the latest book were nonetheless wary of applying the same model to fresh foods. They turned to Blue Apron and other food-focused digital retailers because they were free of the association the budget retailing. However, Whole Food’s reputation is the exact opposite. 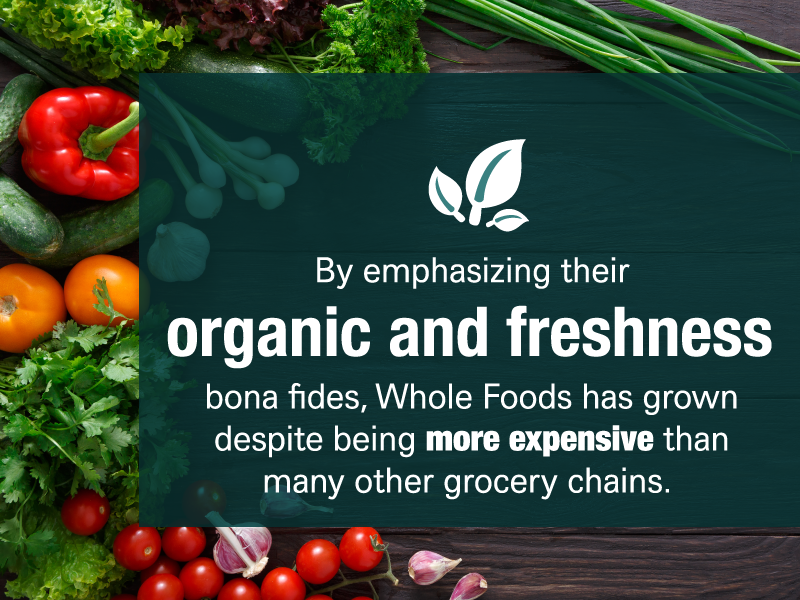 By emphasizing their organic and freshness bona fides, Whole Foods has grown despite being more expensive than many other grocery chains. And now AmazonFresh — presuming it continues to use that brand rather than importing the Whole Foods name — will be capitalizing on its association with Whole Food’s reputation for highest-quality foods. In other words, Amazon is betting on consumers associating the grocery retailing side of their business with Whole Foods — which has come to be synonymous with high-end groceries — with the delivery logistics of Amazon. Furthermore, many observers suspect that Amazon’s notoriously low margins will even allow Whole Foods to lower prices while maintaining profits. For those who are worried about the rise of AmazonFresh, this is the scariest prospect. If Whole Foods can maintain its high-end reputation without the need for actual high-end prices, all while moving into the digital retail space, other companies are going to struggle to keep up. It is no coincidence that Amazon is simultaneously releasing their newest lifestyle gadget designed to make shopping easier. The Dash was a device first released in 2014 that enabled consumers to scan barcodes and immediately add those products to their AmazonFresh account. While the device replicated functions readily available on smartphones, the product was designed to be sturdier and more convenient than a multipurpose smart device. If you ran out of milk, you simply scanned the barcode on the carton, and another carton of the same product was added to your AmazonFresh account. Plus it was sturdy and designed to be stuck to the fridge so it was at the ready whenever you opened the fridge and discovered you were out of your favorite flavor of yogurt. In addition, the Dash came with a voice feature that allowed consumers to use their voice to add new products to their AmazonFresh account. That way, if you wanted a product you didn’t have a barcode for, it could be added just as easily. However, the Dash was released before Amazon’s digital assistant — Alexa — had been released. Furthermore, it still required that a consumer complete their transaction through the standard Amazon checkout interface. You may have been able to add items to your cart with the Dash, but you still had to check out using your computer or phone. The Dash Wand is trying to solve these issues. It is Alexa-enabled, meaning you can use the personal assistant to make purchases even if you’re not sure what ingredients are needed for a recipe or if you want to do some price comparison. It also removes the need for a separate checkout step, making it even more convenient than its predecessor. However, the biggest deal about the Dash Wand is the price. Currently available to Amazon Prime subscribers, it is priced at a mere $20. Demonstrating how much Amazon is betting on this device, it also comes with a $20 rebate that can be used on Amazon purchases along with a 90-day free trial of AmazonFresh. In other words, they’re giving these out for free because they are confident you will reinvest the rebate in AmazonFresh services and become a regular user. Put all of these facets together, and you have what some observers are calling the “Amazon Life Bundle.” Amazon has long bet on its ability to provide diverse products and services for a low price in part because it bundles those services together. Amazon Prime provides cheap delivery but also access to exclusive digital content. These are very different services, but together they transform consumers into loyal customers. 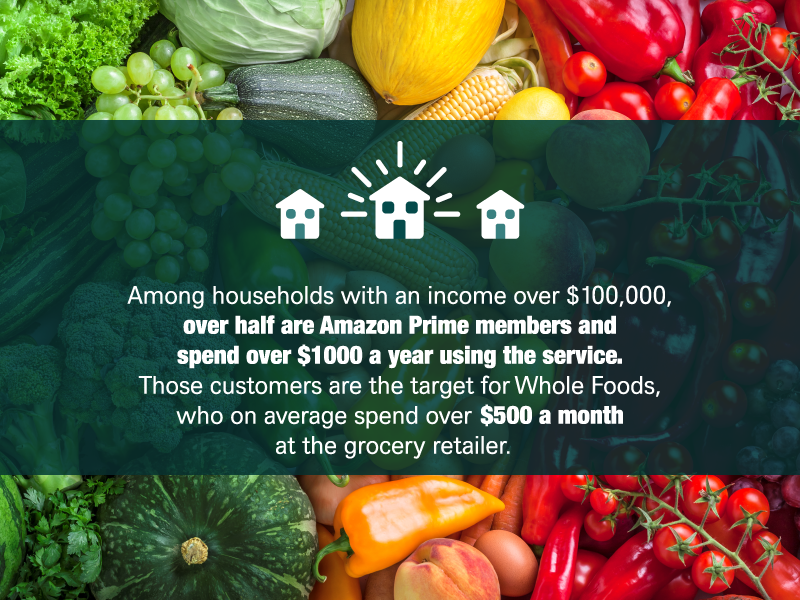 In fact, among households with an income over $100,000, over half are Amazon Prime members and spend over $1,000 a year using the service. Those same customers are the target consumers for Whole Foods, who on average spend over $500 a month at the grocery retailer. The key for Amazon is to bundle these two services together in a formidable act of vertical integration. To make it even more enticing, observers are expecting physical Whole Foods stores to offer discounts to Prime members. Thus, with a Prime membership, consumers are receiving discounted high-end groceries, exclusive digital content as well as expedited yet free shipping and other logistics benefits. That is the “Amazon Life Bundle,” and it perfectly encapsulates Amazon’s attempt to bring their business full circle. Amazon’s acquisition of Whole Foods does more than change the way consumers interact with the grocery market — it will also transform the way producers interact with the grocery marketplace landscape. As more consumers are turning to organic, cruelty-free and sustainably fed meats, ranchers and producers are responding. 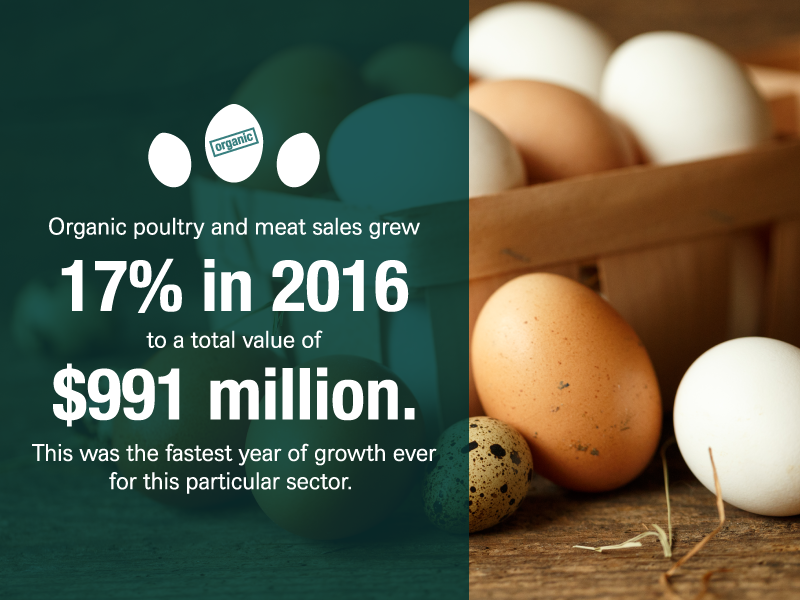 According to the Organic Trade Association (OTA), organic poultry and meat sales grew 17% in 2016 to a total value of $991 million. This was the fastest year of growth ever for this particular sector. However, the logistics of connecting these producers with their markets have forced the pricing of such meat to rise. Amazon’s entrance into this market could reverse that trend, making organic and grass-fed meats more available to a wide range of households. Amazon is being intentional about this, as it has already begun meeting with producers, looking at how their agile distribution model might partner with ranchers and farmers. This is especially appealing for producers who operate in a niche market. While chicken producers, for example, have had an easy time expanding their distribution networks, those who specialize in less ubiquitous products, such as lamb, duck or bison, see an Amazon partnership as a game-changing possibility. Distribution for these niche markets have until now been decidedly low-tech, as the market simply wasn’t big enough to warrant the investment in updated logistics approaches. However, if they could simply plug into Amazon’s distribution network, niche meat producers will be able to upgrade the logistics infrastructure almost overnight. For consumers who like high-quality meat but don’t necessarily have the resources to purchase it regularly, this is an exciting development, as it will surely drive down prices. However, butcher’s departments in smaller grocery chains have a reason for concern. If stock prices are any indication, competing grocery chains are already starting to sweat. 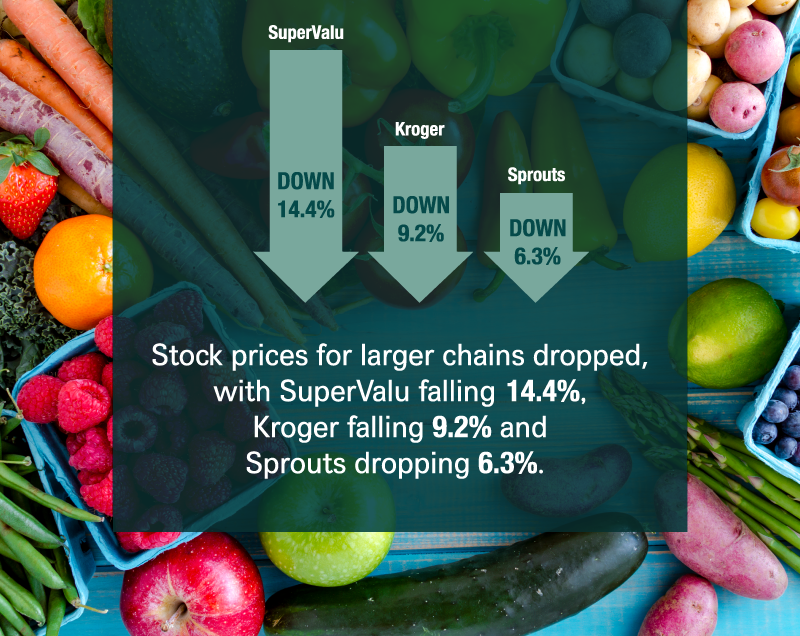 On the announcement of the acquisition, stock prices for larger chains dropped, with SuperValu falling 14.4%, Kroger falling 9.2% and Sprouts dropping 6.3%. So how do these chains, as well as smaller local chains, survive? As we mentioned above with the Instacart/Aldi deal, some are scrambling to make parallel deals. However, there are questions as to whether such a partnership will be able to compete. The problem is many grocery chains have assumed that moving into the digital space would be cheaper and easier than the process of moving into the physical grocery retail world would be for Amazon. By purchasing Whole Foods, Amazon has proven that assumption to be wrong. So already, physical grocery chains are a step behind Amazon. The key will be acting quickly and making sure they don’t fall further behind. Chains must immediately invest in online ordering and customer service. They must hold on to their loyal customers who might be tempted to jump off and switch to Amazon. One of the best ways to do this is to make sure the logistics of switching loyalties are not counterbalanced by added convenience. If a loyal customer can get the same kind of services from their preferred chain, they will be far less likely to invest both time and resources in switching to Amazon. For chains that are more localized, adding online ordering and delivery will likely be easier. They won’t need to implement a global supply chain to compete with the convenience of Amazon. Additionally, those who are hesitant to switch to online grocery shopping often cite customer service as their primary reason. The ability to discuss a cut of meat with a local butcher or unpack the best ingredients for a recipe trumps the convenience of push-button ordering while standing in front of the refrigerator. While these customers may be tempted to buy their laundry detergent and prepackaged foods from AmazonFresh, they still want to talk to a service person when buying fresh food. And since they’re already going to the market for spinach and tilapia, they might as well buy their paper towels there, too. However, Amazon is working hard to disrupt this particular part of the grocery shopping experience. The key for grocery chains is to beat them to it. To stave off Amazon, competing chains need to invest in digital customer service — maintaining the kind of personal touch that customers expect — and they need to do it quickly. Amazon’s food distribution has lagged behind its other successes, and its acquisition of Whole Foods is an attempt to fix this problem. The key is to digitize the strengths of grocery chain customer service before Amazon and Whole Foods figure out the specifics of the integration of their own brands. Amazon may have taken the lead in the race to digital grocery dominance, but they have not yet reached the finish line. Competitors must act now to catch up.